The Web Strategist must understand (by using a variety of techniques and tactics) what users want. This is commonly known as User Experience Research which will create and craft a ‘mental model’. In addition, the strategist will need to be in tune with the community in which their website is part of, this is greater than just users, as it will include competitors, partners, and prospects. Skills: User experience (UX), usability, information architecture, social media skills, customer support, community marketing, marketing, product marketing, ability to listen and be empathetic. 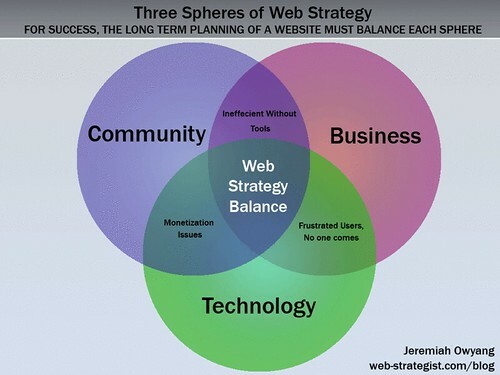 The business sphere requires a strategist to understand the long term objective of a website and it’s goals. This sphere also requires ability to internally maneuver within an organization and maximize the persistent limitation in resources. A website that is not aligned to business or market objectives is ultimately doomed to fail. The User and Business requirements will often match, but will rarely ever be a perfect fit. The Web Strategist) will need to obtain business requirements from stakeholders, whether that be execs, sponsors, sales, or even shareholders. Understanding the market, competitors (and key milestones) and other external forces are also required –a business requirements model will be formed, these are your objectives. Lastly, a Web Strategist needs to know how each and every tool and technology work, they’ll need to know the strengths, benefits, limitations and costs. This also applies to human capital, and timelines. Often technical limitations will reduce the scope of User and Business needs, so you’ll need to incorporate this going forward. Skills: Software Development, Web Development, Web Architecture, Industry Trends, experiments with web technology, but understands how to extrapolate and harness a tool. It’s unlikely he or she is a master at all, but most importantly, has the ability to learn and delegate. In my career, I’ve tried to have a balance in all these spheres (former UI Designer, Marketing Degree, and worked in software engineering group) keeping up with all spheres is nearly impossible. Therefore two skills become very important: 1) The ability to quickly learn, and extract value, 2) Ability to find talent and delegate, no really, I mean really delegate, which requires trust. If you have other skills to suggest, please leave a comment, and I’ll add. I originally introduced this concept August 25th 2006, just about one year earlier, and am now making these amendments. This was primarily spurred by Johnathan’s suggestion of looking at the user sphere as greater than just a customer base, thanks Jonathan, you’re an excellent strategist. Also, Robert suggested I try to incorporate more of a visual representation in my concepts, which I think is a great idea. Did this post interest you? See all posts tagged Web Strategy, or watch the supplemental Web Strategy Video Show.